Absolutely loved this episode. Great work as always guys. Can't get enough of this podcast. We got a new one!!!! 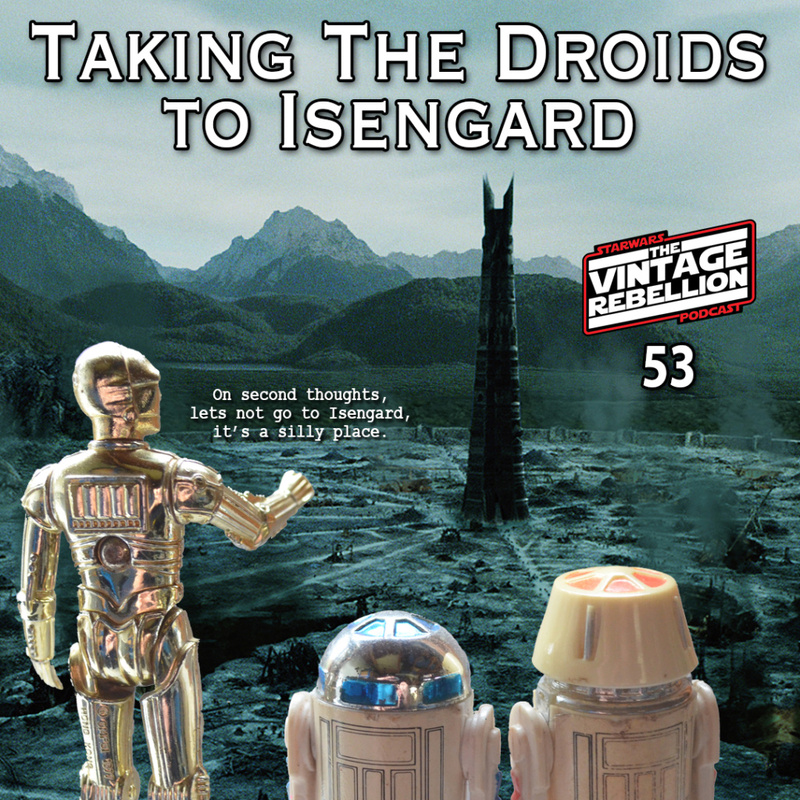 On the 41st edition of the Vintage Rebellion podcast Stuart and Richard chat to Jason West about all things Jawa, and find out some fascinating information neither have ever heard before. In the New Acquisitions section the lads cover some wonderful purchases which have been shown off on the forums and Facebook. The team is joined by Commander Clint Garniss who speaks about his recent trading card finds, Josh Lipscomb who has a wonderful story to tell about an entire 12bk find, 13 of them in fact. Plus once again, as part of the Vintage Rebellion Podcast Alliance Chris Georgoulias gives a wonderful narrative on 2 x Sy Snootles and the Rebo Band concept items that we guarantee you've never seen or heard about before. Something truly special. Rich takes time out to chat to James Gallo about one of the greatest Star Wars auctions of all time before the lads get together to have an old fashioned chinwag on the state of some loose figures. Si takes his first spin at hosting the Quiz. The team hope it will be his last as it successfully exposes them as a bunch of laser brains. And the return of the market continues with a look at the recent Propstore auction whilst also returning is Tracker Top 5 and the new monthly Gimcracker award. All this plus much much more on The Vintage Rebellion Podcast. @Jez Bugger!! I just finished binge listening to the last 3 episodes today, now your telling me I've another 4 hrs to listen to. As always some interesting topics covered, look forward to listening to the next one. Ha! We're starting prep for the next one so you need to get a move on! Binge listening to a 4-5 hour podcast! Good man. Let us know what you thought of this latest one. November and something special for December is already in the pipeline !! The boys are back for the final normal structured podcast of 2017. Mark Newbold joins Stuart and Richard to discuss his new project Fantha Tracks, he also discusses Comics and toothbrushes, whilst also revealing stories from the stars of movies. In the New Acquisitions section, Lee Bullock stops by to talk about his boxed Lili Ledy large size action figure Jawa. The lads discuss a variety of vintage gems and are joined by Ron Salvatore as part of The Vintage Rebellion Alliance whilst covering the very underrated Y-Wing Fighter (not bomber). In this months Rebel Briefings, Richard takes a look at the Mr Klimko auction, gives us an update on Carl Cunnigham whilst taking a look at Empire Day and David Prowse's last outing. Simon's Senate return, and this month he's nailed his sound. This month he is joined by Stephen Savory, Dan Tearle and Steve Magill as they delve into a Custom debate. Pete takes a look at the Market whilst also bringing us Gimcrack of the month. All this plus other gems, makes this another not to be missed edition of The Vintage Rebellion. The final podcast of 2017 from The Vintage Rebellion is full of festive cheer as we throw the format out the window and chat about all things Star Wars. With a new movie released the boys discuss The Last Jedi, so if you haven't seen it yet beware there will be spoilers. We also hear from Michael Cooper, Jason Smith, Darren Quinn, Rob Marsh, Steve Savory, Corey Galal, Carl Dennis and Daniel Burgess on their initial reactions to the movie. The boys take a fond look at some of the events they've attended this year from Celebration and Farthest Froms to Empire Day and Echo Live, and who can forget the FACTs trip!!! Steve Savory acts as The Vintage Rebellion roaming reporter as he talks to star of the screen in live interviews from Wantage Comic Con. Stuart hosts a three part quiz over the course of the show to see who really is the second best man on the podcast after himself. It will surprise you who finishes in last place, or probably not actually. The team recollect the last 12 months of The podcast, as they look at the changes that have taken place as well as each member reflecting on their personal sections. Jez recollects fond memories of his magnificent achievement as The Running Stormtrooper during 2017, including some unheard footage. The team also take a look at their personal collecting journeys from the year and where they hope their collecting goes in 2018. Shawn Moynihan joins up with Pete to create The Vintage Rebellion 12 days of Star Wars Christmas, something joyous to look out for during the show. As well as all this we have plenty of chitter chatter, randomness and festive music for you to enjoy over the Christmas period. We here at The Vintage Rebellion would like to wish each and every one of our listeners a stonking Christmas and a wonderful and healthy New Year. Thank you for all your support, here's to the next 12 months!!! I look forward to listening to it, when everyone else has passed out due to to much food consumption. I'd like to wish everyone involved in the Vintage Rebellion a Merry Christmas. March brings us the longest Vintage Rebellion podcast to date, with Jez still absent without leave the rest of the team can't stop talking. Chris Georgoulias joins Stuart and Richard for this months main interview. Chris discusses a plethora of things including his work with the SWCA and his recent trip to Death Valley amongst many other topics. Mike Havens joins Rich during Rebel Briefings to discuss his convention ICCC. Rich also looks at the best collecting books available and delves into an eBay auction. Newest Acquisitions sees the team look at Palitoy, Helix, Australian Pencil cases, Canadian 2 packs as well as many other items including their focus topic of the Palitoy Droid Factory. Mark Daniels and Chris Hogg also drop by to discuss their recent purchases. During the second instalment of Pete's new segment, he follows on from the Droid Factory discussion looking at other droid items outside of the toy line. He brings us the Droid Factory top 5 and can Simon finally win Gimcrack of the month? Don't bet on it! Simon delves into the market where he looks at eBay and recent auction sales. Whilst Iain Sanderson joins Stuart for a follow up to his Interview from Episode 1. Iain revisits all the topics he discussed four years ago, has his collecting habits changed? As well as all this the boys discuss collecting ethics after being accused of snobbery on their opinion on reproduction items last month, whilst they also have their usual quiz and general discussion. All this plus much more including a Running Stormtrooper update. Rebel Commando focus collector and host of Sixth Scale Scavengers Podcast Christopher James Leddy (vintageviewport) join Stuart and Richard to discuss his collection and his collecting habits. Episode 57 sees Star Wars Tracker developer Jared Cope join Stuart & Pete to discuss his collecting, coins, Australia and of course Tracker. Rebel Briefings this month sees the team delve into the jaw dropping Prop Store Toy Auction as they look at some of the items that are available as well as being in awe of the information that is included in the auction catalogue. 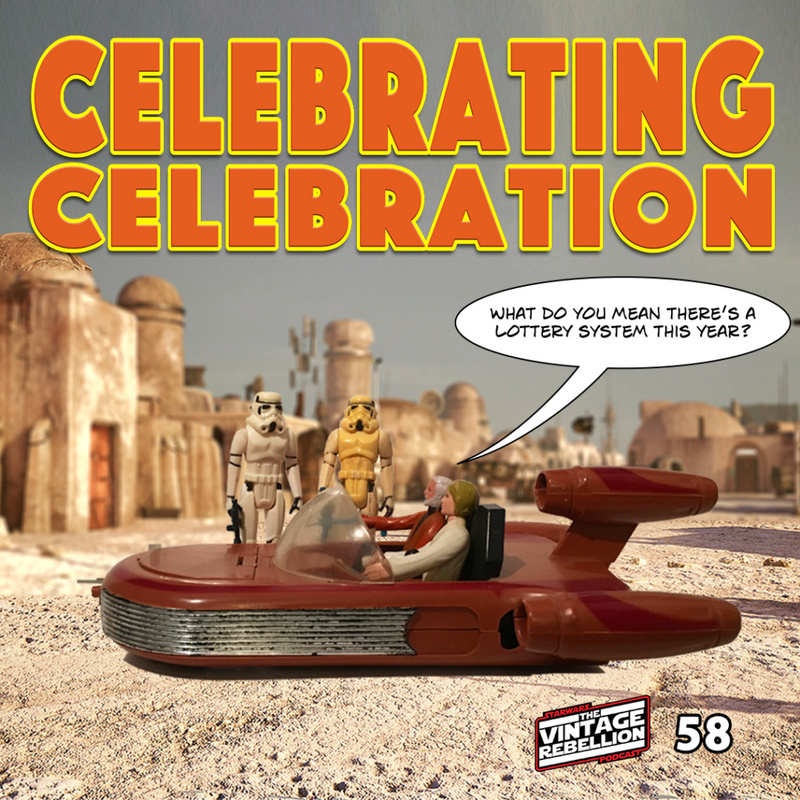 Richard leads the team through some other topics too as they look at R5-D4 Pre-Production, the Podcast stage at Celebration and Chicago and offer their thoughts on the new 'Retro Line' from Hasbro. During Newest Acquisitions the team are joined by Mark Daniels to discuss his latest pick up, a Mint in Box Laser Rifle with red insert and also speak of the purple insert version. As well as this they look at the Pendulum Press Kit again and appreciate the work that Jason Langendorfer is doing to present the audio of this item, they look at Ron Cobb Color Vision book where Pete's loving for the man gets uncomfortable and we look at an amazing Lili Ledy haul picked up by Oscar Galaz, Jez shout outs many other awesome and inspiring purchases before the team settle down for the main topic of the month, the A-Wing, where Ron Salvatore from the Vintage Rebellion Alliance drops by to help the team out with the facts. Pete continues the A-Wing loving during 'Beyond the Newest Acquisitions' where we look at what the A-Wing appeared on, Comic covers, MPC Kits, VHS tapes, he's got it covered before bringing us the Tracker top five of A-Wing items. As well as all this we have the usual delights, we have a Celebration update, the usual quizzes and we hear just what the team had as children and what happened to those toys that inspired their collections today. With Star Wars Celebration in Chicago on the horizon the TVR team mash up a normal feeling show with Celebration. In place of an interview this month we have a Celebration Roundtable where Chris Fawcett, Ron Salvatore and Chris Georgoulias join Stuart and Richard to talk Chicago, Collecting Track, Star Tots and previous Celebrations amongst many other topics, Ron also relays a wonderful story of a rocket firing Fett, David Mandel and a random passing Stormtrooper!!! Richard looks at this years Collecting track in Rebel Briefings but is also joined by Matt George, Gary Borbridge and Stephen Ward for a fascinating look at their new book 'Engineering an Empire', and trust me, after hearing these three discuss it you'll be ordering it there and then! Jez returns to England to host a mammoth Newest Acquisitions segment where he looks at a host of great purchases from knock off Jabba pipes and ESB Paperweights through to Greek Han Solo blasters with so much awesome stuff in between. The team end the section as always with a focus item, this month something the whole crew adore as they delve into the Taun Taun and Ron from the Vintage Alliance drops by for a second time in the show to give it that extra information. Pete continues the love for the Taun Taun in Beyond the Newest Acquisitions, he looks at Lee Wards, Craftmaster and Sigma amongst other items before delivering his popular tracker top five on the hottest Taun Taun items. As well as all this we look at other stories in the hobby, quiz hosted by Jez so obviously that's an extended section! Plus a better look at Celebration where Jez gets Uppity about a title for episode 9 leak. All this plus much much more!! !